Communications On-the-Move (COTM) is an enabler. The technology allows those who protect, defend, and serve to be in constant communication with one another, with command structures, and support facilities, regardless of location. COTM affords �no-matter-where� communications for the warfighter. As part of this issue�s coverage, COTM is brought to the forefront. A number of subject-matter experts were queried regarding their analysis and expectations of COTM. I asked Eric B�ranger, CEO Astrium Services, where he sees the COTM market going this year, as well as where he believes the growth areas will be experienced. �We have been supplying COTM solutions for a number of years, particularly with part of the X-band spectrum dedicated to mobile users. With Skynet 5, we now have very high power X-band with multiple shapeable and steerable spot beams. These provide high gain that can provide high data rates services to small, disadvantaged terminals. Therefore, we see COTM expanding further into the FSS bands as the terminals and mobile networking techniques become available to match the increased satellite performance. As far as what issues Astrium Services might have to confront, and how such �opportunities� will be addressed, Eric answered, �Astrium Services has built significant heritage in Aero and Naval COTM solutions based on FSS solutions. As a specialist operator, we also have experience of spread spectrum techniques that can be a requirement for many COTM applications, particularly UAVs. UAVs are a growing part of the COTM market. Our current communications solutions have given us a valuable insight into the complete UAV system parameters. Our principal challenge is the weight of the RF suite and size, weight and profile of the antenna on the mobile platform. Newpoint Technologies� President Wally Martland voiced his opinions regarding the market in this manner, �Short term, we expect to see most of the growth from the US Army, Navy and the Marines. The ongoing �War on Terror� and the Army�s transformation to a lighter and leaner force has placed more emphasis on providing the war fighter with the most up to date information available in conjunction with complete situational awareness. We expect to see more efforts by the Army similar to the MET Program, which is to modernize the existing COTM infrastructure, and also provide additional terminals to support the forces. �Additionally, the Navy and Marines have also recently started a modernization effort. We anticipate COTM will be a very important aspect of this effort, and we expect to see it in increased activity by these two organizations, although we have not directly started to work with them as of this writing. Overall, COTM is a most important and critical requirement for the US military, if it is to achieve it�s goal of net centric warfare and pushing the situational awareness information down to the war fighters. �Newpoint has been providing solutions for managing remote and transportable terminals to commercial and civilian organizations for many years. Our COTS solutions are already proven in providing �lights out� operation of these terminals in this environment. One of the unique challenges in applying these products to the military COTM marketplace has been managing the treatment of secure and unsecured data, essentially managing the handling of the data on the Black and Red networks, which could, potentially, be carried on the same COTM Terminal. We are fortunate that Scott Herrick recently joined us, having retired as a Lieutenant Colonel in the U.S. Air Force. Scott has extensive experience in this area. Our parent company, ISI, also has expertise that has helped us find a path to solve this problem. When queried as to whether Newpoint Technologies has any immediate plans for additional programs or projects within the COTM arenas, Mr. Martland answered, �Newpoint has a number of R&D efforts underway that will significantly enhance our offerings to the COTM marketplace. The first is a service based management system, which will sit on top of our core Compass management platform. This will allow the operators at the COTM Network Operations Center (NOC) to manage all of the services being carried out via the network. It will allow them to view from source to destination all the equipment associated with the delivery of a particular service. In the event of a failure of any equipment in the network, they can see the affected services. This will allow them to re-assign resources on the network, and enable them to restore the high priority services, immediately based upon the available resources. �Combined with this platform is a profile manager, which will associate a terminal configuration database for each of the services that use the network. In this manner, they will only have to select the source and destination terminals and then apply the profile to bring the service online when scheduled to come up. Operators can also save new profiles or change existing profiles for each service as conditions dictate. Newpoint�s President continued, �In order to achieve this objective, we have to look beyond managing the satellite RF Equipment, but we also have to look at managing the UPS, generator, and power subsystems, the HVAC systems, and everything else a technician on site would be monitoring that could affect the operational capability of the terminal. This includes automating many of the routine tasks an operator would take on, such as accounting for rain fade and other weather conditions, and also providing orderly shutdown of the terminal when the generator is out of gas and the UPS is running low. This automation is essential to the operation of the terminal and is required for truly �lights out� operation. As far as the primary issues that will need to be confronted, Mr. Badders believes the �primary issue to a successful COTM deployment is having a complete understanding of customers requirements as well as a solid concept of operations. Plus, companies must educate the customer on the capabilities the industry has to offer. There are many advanced technologies available today that are just not being used. Integrating the various technologies into a workable system, tailored to meet the customers communications needs, is the key to ensuring a successful mission. According to Tom, Telos Corporation is pursuing opportunities with multiple potential customers in the deployed military environs and military/civil defense organizations. �However, there are still many legacy systems fielded and new systems being fielded that are not compatible across services. Ric VanderMeulen, the Vice President and General Manager for ViaSat�s Government Satcom division, believes there will continue to be a great deal of experimentation within the Mil-COTM environs, as well as some limited development targeted to the use of existing satellites in addition to the new, dedicated satellite systems. 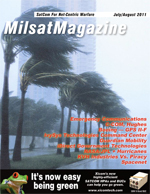 The military envisions the future Mil-COTM market to be served by the TSAT satellites�the systems using existing or commercial satellites have not been considered the main event. Mr. VanderMeulen believes the primary COTM market growth will actually on be on the commercial side. �We are seeing steady growth in both business jets and maritime market segments. These segments have been served by L-band (Mobile Satellite Services), but we are noting growth and transition to Ku-band services, such as our ArcLight system, which offers greater throughputs at lower equipment and operational costs. When it comes to the issues facing COTM-involved business, Ric says, �The issues are neithter technical or regulatory. The technology is proven and the Ku-band FSS (Fixed Satellite Services) has been licensed to provide COTM services. The issues that do exist include market acceptance and coverage areas. The L-band MSS satellite providers have achieved two or more decades of market acceptance, and they have coverage of most of the earth�s surface including land and ocean coverage. �The Ku-band FSS satellite services, such as ArcLight, offer greatly improved throughput (speed and capacity) at much lower price points. Their presence in the marketplace is growing, as well as the coverage areas available to use them. Current coverage areas include the U.S., Caribbean, North Atlantic, Europe, and Mediterranean, with further expansion planned for this year. Inquiring about the issues to be faced ahead, ViaSat�s Government Satcom Vice President stated, �The significant issues facing the military organizations include �organic� versus �commercial� development, understanding COTM versus COTP (coms-on-the-pause, or portable satcom) utility, and dealing with the lack of available satellite capacity. �Due to the newness of the technology, the military is using commercial capacity, and developing its own organic capability. VIPSAM, Stryker, and the C-130 Gunship efforts are all examples of adapting and employing commercial technology to a military need. PM WIN-T and TSAT are examples of organic development to achieve the same fundamental utility. Small antenna terminals providing COTM consume more satellite resources than large antenna terminals providing COTP. There is an architectural tradeoff between COTM versus COTP with local area coverage.